If you’ve been following along, my middle-child-bird has been laying eggs and disrupting the entire flock dynamic. One of our items is on the back burner for another time, but the Nutri-berries have been well received by all the girls. We’re been using Nutri-Berries for years and were very excited when Chewy started offering them. It’s been more difficult to locate them at retail since I moved to the D.C. area two years ago, and now I can put them in my usual Chewy orders with no fuss and no shoes on. We sampled the Classic flavor this month for the first time, and Koi Monkey was as excited to have them as she’s always been. 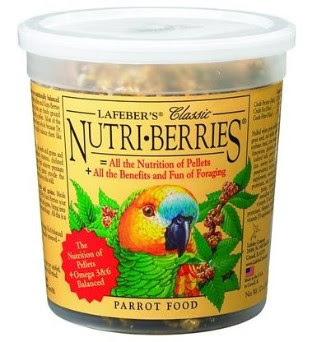 If I needed to get her out of the nest, I opened up the Nutri-Berries. They are also a complete food that encourages their natural foraging abilities. I’ve got two videos to share with you. The first is a few minutes long, when I was learning to play with YouTube and the girls were very young. The second is less than a minute, posted to Instagram a few days ago. All orders $49+ ship free with 1-2 day shipping. I hope your flock enjoys their Nutri-Berries.